On 4 December, Maria del Mar Bonet is giving a concert at the Cairo Opera House in Egypt, in which she will be accompanied by the percussionist Hossam Ramzy. The Mallorcan singer-songwriter is touring to commemorate her 50 years of performing on stage and to present her latest album, Ultramar. Maria del Mar Bonet has worked with artists from all around the world and her voice is regarded as one of the most iconic in Mediterranean culture. She has defended her mother tongue, Catalan, and Mediterranean culture and music, for which she has won prizes from all over Europe, Russia, Morocco, Tunisia, the United States, Cuba, Japan and many other countries. As part of the celebrations to mark her 50th anniversary in music, Bonet is putting on a concert entitled ‘Beloved Friend’ on 4 December at the Cairo Opera House in the capital of Egypt. Her latest work, Ultramar, represents a change in the singer’s source of inspiration, as she has swapped the waters of the Mediterranean for the Caribbean and has immersed herself in Cuban music. Consequently, we find melodies from the Caribbean on the album, the fruit of her collaboration with Cuban musicians of the standing of José María Vitier, Pancho Amat, Jorge Reyes and José Luís Cortés, also known as ‘El Tosco’. On this occasion, Bonet is partnered by the musician, composer and producer Hossam Ramzy, a renowned percussionist whose unique forceful style has led him to work with great artists from North Africa such as Cheb Khaled, Rachid Taha and Faudel. Ramzy has previously shared a stage with Bonet at the concert of Mediterranean cultures organised by the United Nations last year in Geneva (Switzerland). 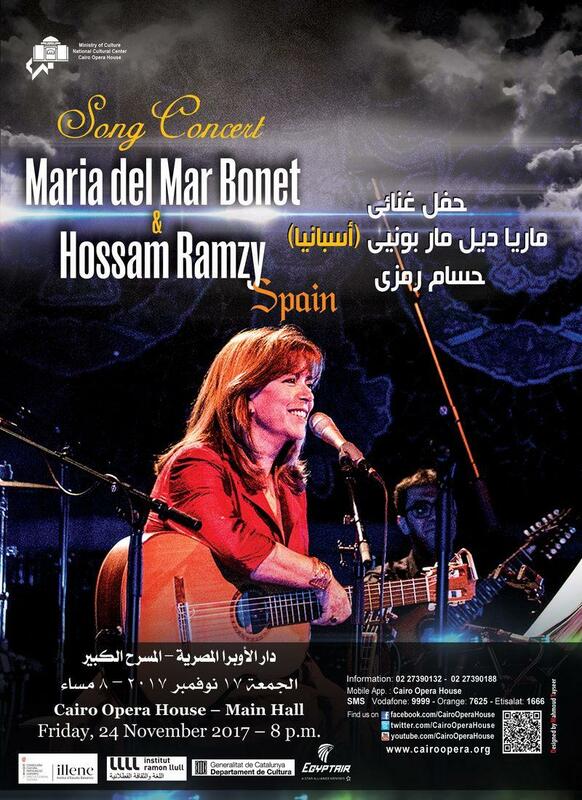 Maria del Mar Bonet’s music will also join with that of an Egyptian band featuring Hossam Ramzy on percussion, Mohammed Fouda on nay, Ragy Kamal on qanun and Salah El Ghareeb on oud. The concert represents a collaboration between Mediterranean cultures of a remarkable magnitude that is rarely seen. In addition to Egypt, Bonet has already put on concerts in a number of other countries, such as the one she performed on 24 July on the stage of the Roman amphitheatre of Eljem in Tunis together with the Traditional Music Ensemble of Tunis. She will also be visiting Greece, Italy, Cuba and Australia on the same tour. Maria del Mar Bonet (Mallorca, 1947) began her career in the iconic Nova Canço (New Song) movement and as a member of the Els Setze Jutges group. Over the course of the last five decades, music has taken her all over Catalonia, the Balearic Islands, Valencia and Spain, but also across Europe, North Africa (Tunisia, Morocco, Egypt and elsewhere), North and South America, Japan and Syria. She has also worked with a large number of artists and orchestras in the countries she has visited, though she has always remained deeply attached to her roots, the sounds and rhythms of Mediterranean cultures. The prizes Bonet has won attest to her prolific artistic carer and include the Gold Medal of the Balearic Islands (2017), the Sant Jordi Cross (1984), awarded by the Government of Catalonia, the Cubadisco International Prize for the best foreign album (2011), given to her in Cuba for Bellver, and the Charles Cros Academy award for the best foreign record released in France (1984).